The objective of I Made Potty is to land the poo in the potty. The I Made Potty carnival game operator decides the distance from which participants will toss. We can substitute ping pong balls for boo..but trust us when we say...the kids love the poo. 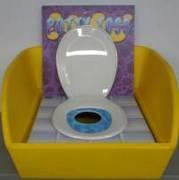 The I Made Potty carnival game is perfect for ages 1 and up.